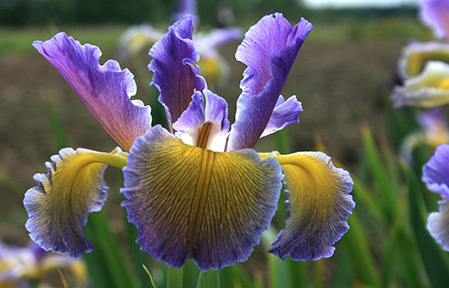 Spuria irises continue the iris flowering season through into July and August. They have a wide geographical range, being native to the Mediterranean, Asia Minor and North Africa. They require full sun and a good loam or clay soil. They are happy in both acid and alkaline soils. They make excellent border plants, providing strong vertical lines. They all make strong clumps and should be allowed a spread of at least 50cm.